Celtic weddings wrap lots of warmth, fun and memories. Personalized 5x5 in Irish Celtic weddings save the date round corners magnet exude the beauty and pleasure of any traditional Celtic wedding ceremony. 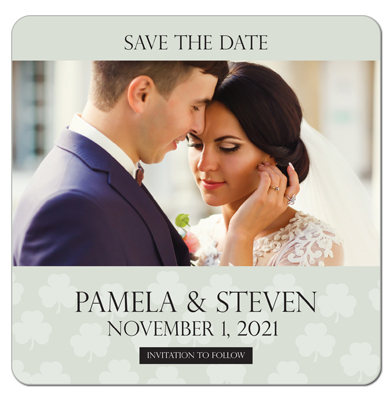 Custom 5x 5 inch Irish Celtic wedding save the date round corner magnet is apt for all those who wish to cherish memories of a colorful wedding through lifetime. It will moisten their heart with the warmth of memories and your guests will always cherish the relationship that they share with the couple. Product Size: 5 in. x 5 in.